APA worked with the Trinidad Neighborhood Association to organize a Community Planning Workshop prior to APA's Federal Policy and Briefing Program and Fall Leadership Meetings in Washington, D.C. This was an opportunity for planners from around the country to participate in a pro bono community planning effort. Held during APA's Fall Leadership Meetings and the Federal Policy and Program Briefing, nearly 60 people participated in the Trinidad Community Planning Workshop at Gallaudet University on September 29, 2012. Over 30 planners from around the country met with Trinidad residents, local business owners, DC government agencies, and other stakeholders to discuss the future of the neighborhood. 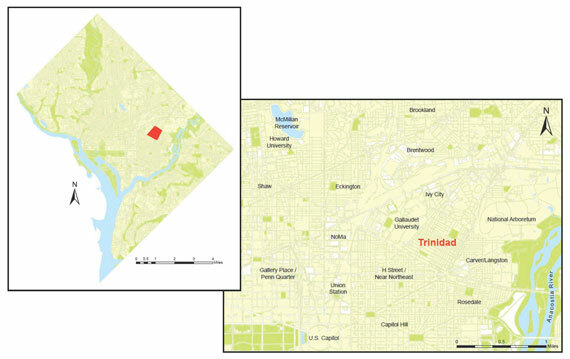 Located in the northeast quadrant of Washington, D.C., Trinidad is bounded on the south by Florida Avenue, on the west by West Virginia Avenue, on the north by Mount Olivet Road, and on the east by Bladensburg Road. To the west of Trinidad lies Gallaudet University, the first school dedicated to the higher education of the deaf and hard of hearing, and Mount Olivet Cemetery and the National Arboretum lie to the northeast. The name "Trinidad" is believed to derive from a former land owner who lived on the island nation of Trinidad. As the story goes, the Trinidadian died before he could relocate to his landholding in Washington. Over the years, the area (0.27 sq. miles) changed hands several times — from the Corcoran family to Columbian College (now the George Washington University), then to the Washington Brick Machine Company. The brickworks excavated the land for clay, but eventually decided to sell parcels of land to developers. In the late 1800s, the first houses were built in the southeastern section of the area and Trinidad was later formally established as a Washington, D.C., neighborhood in 1888. American League Park, home of the Washington Senators major league baseball team, was located in Trinidad from 1901 to 1902 before the team moved to Boundary Field and then to Griffith Stadium in LeDroit Park a couple of miles to the northwest. Since its beginnings, Trinidad has remained a working class neighborhood. Though once more racially integrated, Trinidad is today a predominantly black and African American community. Suburban sprawl and white flight affected Trinidad like many other urban communities across the country in the mid-20th century. The 1968 riots in Washington following the assassination of Martin Luther King, Jr. also played a significant role in the neighborhood's history. Trinidad experienced further decline amidst D.C.'s infamous crack epidemic during the 1980s and '90s. Much of the neighborhood's past and decades-long decline have plagued the area with a negative public image. Furthermore, despite a declining crime rate, the area still suffers from widespread perceptions of rampant crime. Trinidad today contains many quality affordable housing options — an important asset that the community's many low- and moderate-income families would like to protect. Much of the Community Planning Workshop will concentrate on how the community and the city can better protect the character and affordability of the neighborhood, while improving the quality of life for all residents. Connecting the neighborhood to several business corridors on the edges of Trinidad will also be a subject of the workshop.